I've been thinking about all the techniques that will be involved in making the new ends for my concertina. Several of them I have never done before, or not to the level of detail and finish I'm aiming for here. I've decided that it would be a good idea to make a partial end first to practice on, as I would hate to make an elementary mistake and ruin one of the real ends at a late stage in the process. Here's a photo of the kind of end I'm planning to make. 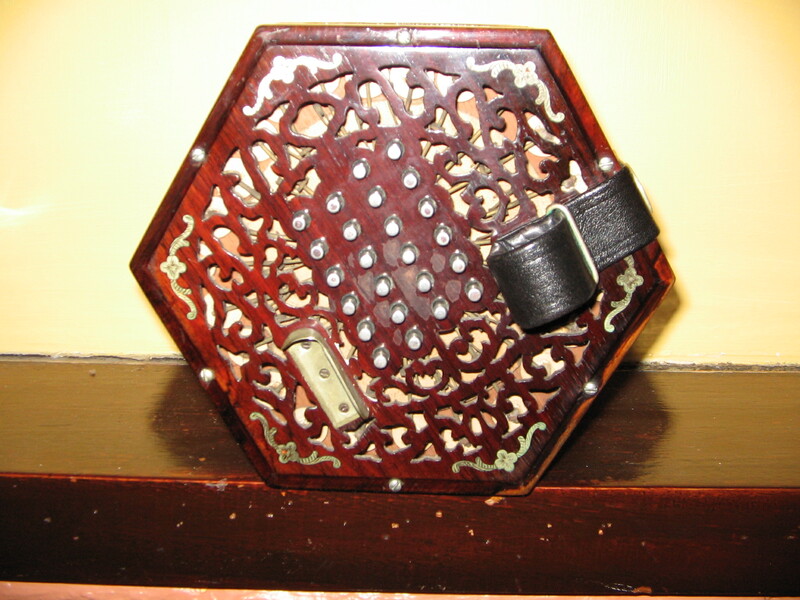 I haven't yet decided whether to do the fretwork in the middle circle around the key holes - my concertina probably didn't have it originally (like this one). Cut the maple boards roughly to length. Glue the boards together edge to edge and press flat until dry. Mark the shape of each action box side onto each board very accurately (marking the boards so I know which side they are and which way up). Cut and plane/sand the boards a fraction of a mm smaller than the action box sides (to leave room for the veneer). Make a scratch stock from photos of the edge moulding and use it to mould the edges of the boards. Sand the faces of the boards to get them very flat and smooth enough to veneer onto. Veneer the moulded parts of the boards using six strips per board, carefully bevelling the ends to avoid gaps in the corners. Trim off the excess veneer. Veneer the main part of the top of the boards and the whole of the bottom and press flat until dry (you do the bottom at the same time to reduce the risk of warping as the top veneer dries and shrinks). Trim off the excess veneer. The aim at this point should be for the bottom edge of the board to be a tiny amount bigger than the action box sides, so the joint can be blended together later. Lightly sand the veneer to get it smooth and blend the joints where necessary. Inlay the metal corner decorations (a very kind member of the concertina forum is sending me an original set of them). If necessary, fill any small gaps between veneers and around the inlays with a filler made from a mixture of glue and sanding dust. Prepare the fretwork template and glue it on (probably using thin hot hide glue). Drill at least one hole in each piercing for the saw blade. Cut all the fretwork with an electric scroll saw. Drill the mounting holes for the thumb straps and little finger rests (clearance holes for the long screws and pilot holes for the short screws). Accurately mark out and drill the key holes (need to figure out a good way to locate them). Ream the key holes slightly oversize with a shallow taper reamer to make space for the felt bushes. Remove the paper fretwork templates. Clean up the edges of the fretwork where necessary with needle files and fine emery paper. Remove the old lacquer from the action box sides. Make the tops of the action boxes flat (this will probably involve gluing strips of veneer on to build up the low areas and then sanding down the high areas using sheets of emery paper glued to a flat worktop). Glue the action box sides onto the new boards, lining the edges up very carefully. Blend together the joins between the boards and the sides with fine emery paper. Drill the bolt holes through from the bottom. 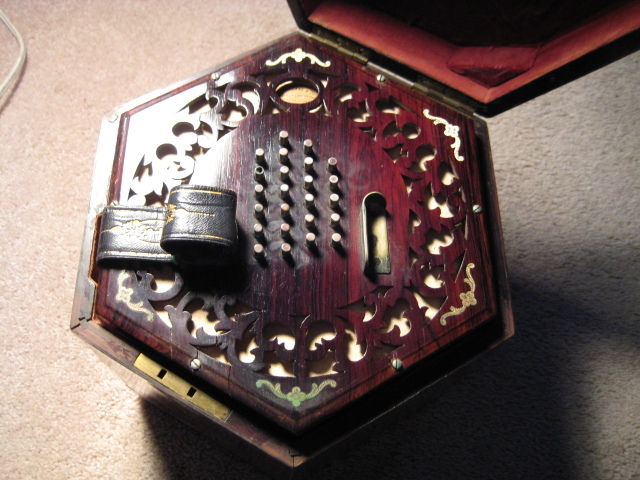 Possibly stain the top veneer and the inner edges of the fretwork to get it to more closely match the colour of the original veneer on the action box sides. Produce new maker's and serial number labels and glue them on (will need to get them photocopied or laser printed onto good quality paper). Make and fit the woven wool felt key bushes. Possibly replace the support pieces inside the action boxes (I suspect the old ones won't be exactly right for the new ends). Does the heel of your palm touch the ends when you're playing? Will that affect how fancy you want the fretwork to be at that point? Good thought, but with an English your palms are supposed to be clear of the ends when playing. In practice I find my hands often touch the nearest corner and the area near the thumb strap; if you look at the second photo above you can see that it's grubby in the areas where the player's hand has touched the wood.